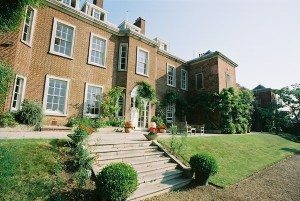 So, last Thursday we decided to get the train to Lewes and try the restaurant at Pelham House. We’ve been meaning to go there for a while as we’ve heard good things. We like getting out in the week, as restaurants often have more time for you and it’s not as manic. Nanny pat had given us clearance and with it being smack bang in the middle of the hellidays – I really needed to get out of the house. Seriously, it is getting easier and the boys (4 & 6) don’t try to kill each other as often but as a lot of parents will know – this time is still rather testing. “I’m going to kill you, I’m going to punch him in the face and I hate this day” have been frequent sentences over the past few weeks, probably best not to repeat to many of my own!! The train pulled in at Lewes station and as it was raining we headed straight to the taxi rank. The taxi driver clearly didn’t want this fare and we understood why once we walked over the bridge turned left and then right up a little lane. This took just a couple of minutes and it’s signposted. You know your getting close when you have a huge flint wall to the left of you and your curious as to what’s at the end of it. Pelham House has been restored to its former glory, this 16th century town house is absolutely stunning and apparently the gardens are beautiful but we were both starving and did not fancy exploring in the rain. At reception we briefly take in our glorious surroundings before being shown to our table in the restaurant. Thankfully, the beautiful high ceilings, sash style windows, wooden wall panelling and gorgeous dark wood flooring are a common theme throughout the building. We even thought about calling nanny Pat to see if we could get overnight clearance but unfortunately Steve had to work the following day….next time. We are served by the lovely Xavi who clearly knows the menu and once we’ve picked our starters and mains he recommends a Chilean Pinot Noir – a clear winner in our book. Before our starters arrived, we were offered bread and given a small cup of soup. You always know your somewhere nice when this happens and this really did tantalise our tastebuds. The soup was delicious, tomato based, creamy, rich, slightly spicy and well seasoned. 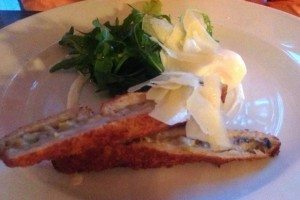 Our starters arrive, Steve chose the croque madame with smoked english cheddar, wild mushrooms & leeks, poached egg and shaved parmesan. This we heard was new but after one mouthful it’s clear this has to stay. Obviously not a toastie but a deep fried crispy wedge with a soft centre, this was light in flavour but complimented beautifully by the smoked cheddar, poached egg and parmesan. A wonderful combination of texture and taste. 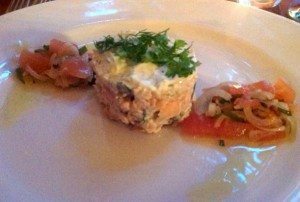 I opted for the tian of smoked trout, potato salad, horseradish and sauce vierge. This is presented like a layered cake – the top is a potato salad with chives, the underneath the smoked trout and each side there’s a sauce of tomato, onion in olive oil. This dish is packed full of flavour with each one complimenting the other with the horseradish coming through. Needless to say that starters went down in silence, accept for the odd “mmm” and “you have to try this”. We eagerly awaited our mains. Steve had the roast pork belly with chick pea and chorizo cassoulet and I chose the ribeye steak with handout chips and peppercorn sauce. Steve starts to eat his main and after a few mouthfuls is adamant that this is the best pork belly he has ever had. 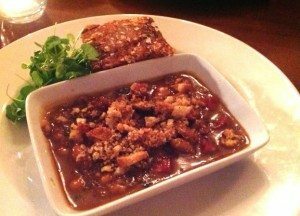 The cassoulet is an excellent accompaniment to the pork belly which is tender and pulls apart with a crisp pork crackling top. The cassoulet is delicious, with tomatoes, butter beans and chickpeas. All together this dish is superb and one I’ll be going back for! My ribeye is what I expect, locally sourced – you could tell this is a good quality piece of meat and they cooked it as requested. 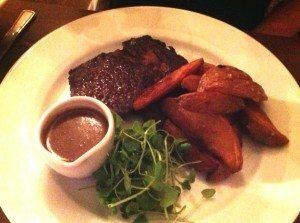 The skin on thick chips are delicious and the peppercorn sauce is certainly up there with the best I’ve had. The Pinot Noir is finished and we resisted another bottle. 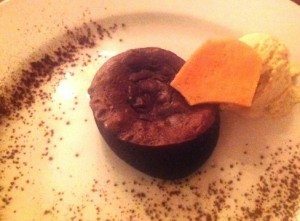 Instead we choose to have a dessert wine to accompany the lemon tart with raspberry sorbet and Steve’s Varlhona chocolate fondant, salty fudge, honeycomb and vanilla ice-cream. As the chocolate fondant can take 20 minutes; Steve decided he wanted an irish coffee in between – this is normally something we leave until the end or swap for a dessert but he’s clearly getting carried away and who I am to judge! His Irish was very good and the cream floated (as it should) on top of the dark alcohol induced coffee. This just confirms that the staff at Pelham House know what they’re doing as we’ve been to a few 5 start restaurants that just can’t get our favourite nightcap right.. 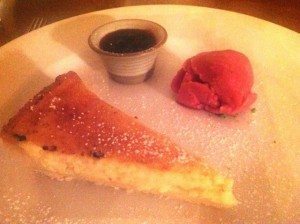 The lemon tart is divine – combines beautifully with the raspberry sorbet and lets not forget the Muscat dessert wine – amazing! Steve is silent and looking like heaven has just swept him up to hand feed him and I have to nudge him to get offered a mouthful. MMMMM yes, I like his as much as mine and we’re both swept off to heavens kitchen together – far far away from cries of our children and their relentless unreasonable requests! !